Rather like Good Little Wolf, this is a darker-than-average tale that still manages to be very funny. It is an unusual book in the sense that very little emotion is conveyed either by the expression of the characters or by the narration. In fact there is no narration, as the story is merely the dialogue between the various characters. No. Why are you asking me. I haven’t seen any hats anywhere. I would not steal a hat. 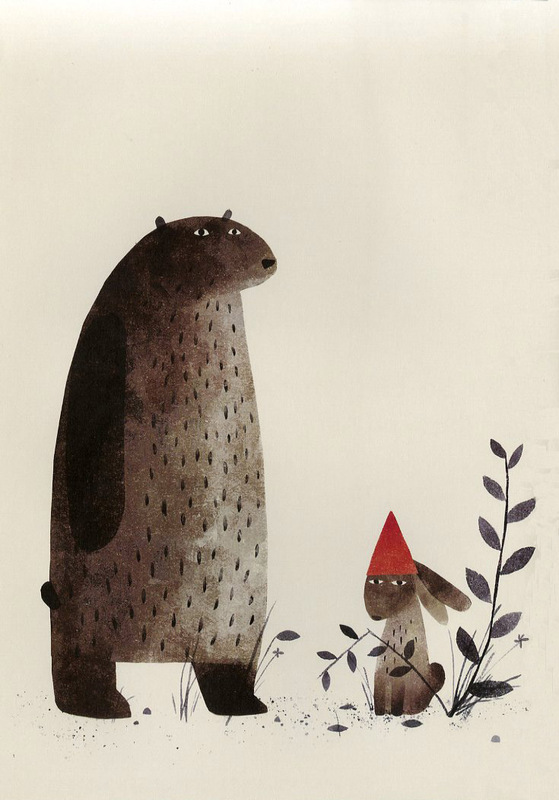 Jon Klassen’s 2011 book was an instant hit when it came out and actually made it to the top of the NYT’s Bestseller List. He is a man of many talents, mostly artistic (which is obvious from the style of I Want My Hat Back) and worked on the animation for both Coraline and Kung Fu Panda. This year, 2013, he won the Caldecott Medal for Illustration for his latest book This is Not My Hat. Despite some arguments about whether the ending of I Want My Hat Back is appropriate for a children’s story (in terms of a central character being eaten with no reported repercussions for the bear) it received critical acclaim and international popularity, particularly in Europe (Klassen is Canadian) where we apparently like our children’s books full of humour and the darker the better. Certainly the moral of the story (steal a hat, risk getting eaten) is more in tune with the classic fairy-tales of those like the Grimm Brothers. Where I think this deserves plaudits is in the interpretative work required by the reader to intuit the story from the spare illustrations and text, and particularly to read behind the lines of the defensive protestations of the rabbit and bear. This won’t be to everyone’s taste, but children will love it. This is a beautifully presented re-telling of the classic tale. The text is by Lynn Roberts and the story is illustrated by her brother David. Their version is set, very elegantly, in an Art-deco style. Cinderella’s ball-gown is a flapper dress with long pearls; her transport to the ball is an enormous Rolls Royce; the wicked step-mother’s feather hair ornament is about three feet long, and Cinderella watches her sisters depart for the ball with a copy of Vogue in her apron and a couple of Clarice Cliff mugs on the draining board. The drawings are delicate and detailed, with many tiny things for observant little eyes to spot, and full of humour. One rather green-faced ugly sister clutches an ice-pack to her head the morning after the Ball, and the two of them are seen making a real effort to spoil the wedding photos on the last page. Lynn Roberts’ text is a strong one. The story is fleshed out with details like Cinderella’s name (Greta), and those of the step-sisters, Elvira and Ermintrude: “Elvira was as wicked as Ermintrude was dim, and Ermintrude was very, very dim.” The writing is fluent and easy to read. “In a time not too long ago, and in a land much like our own, there lived a young and beautiful girl…” The words are quite sophisticated and there is a subtlety to the humour that would suit slightly older children, so given this and the length it is probably better for the over-threes, but bookish two year olds would definitely enjoy it. A classic story lifted out of the ordinary by the elegant detail of the period setting. This article, Fairy Tales too scary for modern children, say parents, appeared in The Telegraph a couple of weeks ago, following the results of a survey showing that one in five parents have eschewed the old stories in favour of modern picture books. The issues that have been raised centre around two key aspects of the tales. First is the potentially scary content of some of the stories. It’s not difficult to guess which of them may cause problems. Two of the three little pigs are eaten by the wolf, who also (ok, probably not the same one) consumes Grandma, Red Riding Hood, and the seven little kids. Hansel and Gretel are kidnapped by a witch and in real danger of being eaten. Rumpelstiltskin promises to take the princess’s child from her. Rapunzel is abducted and imprisoned in a tower. The Gingerbread Man is reduced to nothing but a handful of crumbs by a cunning fox. Secondly there is the issue of changing roles in modern society. Cinderella, so the article points out, has a young girl slaving for her elder sisters. Snow White is permitted to stay with the dwarfs on the basis that she keeps their house clean (something they seem to have been doing perfectly well by themselves to that point). Most of the women in the tales are subservient and even in their happy endings their ‘achievements’ are to marry well and look pretty. Red Riding Hood’s journey through the wood alone seems laughably stupid in a world in which small children can’t even walk to a corner shop to buy milk. Undoubtedly old-fashioned and scary as they are, are they actually that damaging? The thing about fairy tales, unlike modern stories, is that the characters tend to be two-dimensional. We do not hear too much about what they think or how they feel. The wolf eats Little Red Riding Hood without much drama, the three little pigs are despatched in a matter of fact manner. Without this the stories are less deeply frightening and more thrilling. It is not horror that we see. Without wishing to generalise too much modern children’s books have a tendency to blur the boundaries between good and evil. Bad characters are redeemed. Naughty behaviour is sometimes funny. No ‘real’ evils or threats cross the paths of our heroes and heroines. Whilst they may do an excellent job of helping children to explore their emotions and understand relationships they are more complicated in terms of punishment and reward and morality is not always obvious. Traditional fairy tales do teach some fundamental lifeskills in imaginative ways. Hansel and Gretel may be in a dark situation but they survive as a result of their initiative and resourcefulness. Little Red Riding Hood learns a valuable lesson about listening to her parents and staying where it’s safe. The Gingerbread Man’s pride comes before his inevitable fall. Although there are elements of these stories which are old-fashioned and need explanation, especially with regards to gender roles, it is short-sighted to dismiss them out of hand. Read right, there is still a lot to be learned – and enjoyed – from the traditional fairy tale.